A client who organizes one of the most well-known events in the world recently asked if we knew which mounting devices would be best suited for hands-free ticket scanning with our codeREADr iOS app (iPod, iPhone, iPad) and Android OS app (smartphone, tablets, rugged devices). Due to confidentially agreements, we cannot tell you the name of the organizer or the event. However, they manage event access control in ways similar to the way most events do it – namely by scanning barcodes or tapping NFC wristbands. We don’t supply hardware but we thought we could at least share with you what we found. Having the ticket-taker scan tickets while holding the scanning device is necessary in many cases. However, mounting the device for hands-free scanning could lead to faster access and happier patrons. We think it’s a very efficient method since ticket-takers can use both hands to scan tickets or attendees can even scan their own tickets. In fact, a single attendant could watch patrons scan their own tickets and monitor multiple lines simultaneously. Think of it as self-check-in at events the same way there’s self-checkout at retail establishments. Ideal for this type of setup is our Kiosk Mode. Critical to the success of such a setup, the device’s scan engine must read the barcodes extremely fast and accurately without requiring the person presenting the ticket to hold their hand still for capturing the ticket ID for validation. Our SD PRO scan engine already enables that for 1000’s of clients every week, so that’s not a problem with printed or mobile tickets. If our clients want to read NFC wristbands instead of barcodes, that’s no problem. The NFC enabled device running the Android operating system (like the Famoco FX100) could need to be mounted in a similar way. However, for self-check-in, you will need a visual a ‘target’ for the patron to tap. Alternatively, you might consider using an accessory like the pcProx readers that can read not only NDEF-compliant NFC tags but also a wide range of proprietary formats as well. In some cases, you will want to scan using the rear-facing camera of the iOS or Android OS device because almost all the built-in cameras have autofocus, enabling the fastest scanning. The position of the mounted device can vary from fully vertical to fully horizontal, with or without a ‘target’ to indicate where to place the barcode to be scanned. 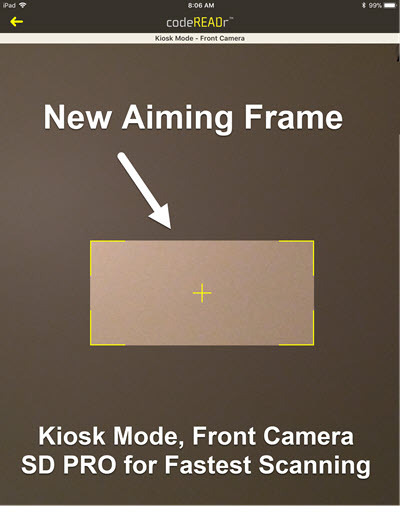 You could also scan using the front camera but, since the front camera typically doesn’t have autofocus, you should test that first to see if it will read your barcodes fast enough. You can Google search for many options. For example, you can screen mirror your entire iPhone, iPad, or iPod screen to an Apple TV.